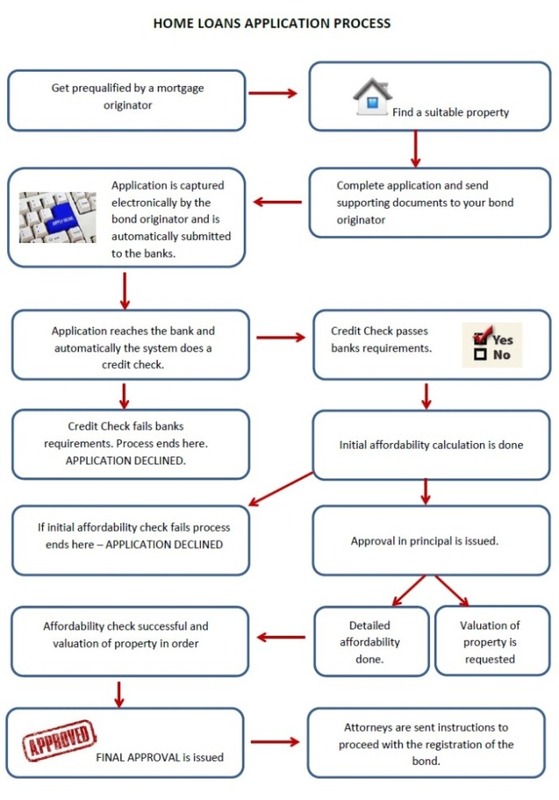 SA Homeloans: Ever wondered why some banks approve applications while other banks decline them? Why some banks give 100% bonds while others only give 85 – 90%? The answer is quite involved, but I’ll try to explain. Regarding some approving and some not all depends on your personal credit profile as well as your internal bank rating and their internal rating system called the bank scorecard. Your credit profile needs to be clear for a bank to approve your loan, and in addition to that you need to have a high enough credit score for them to approve. Most banks require a credit score of 600+, so if you fail that first hurdle you might be declined. Your internal record at the bank involves accounts you may have with that bank and how you have conducted those accounts. The bank scorecard is an algorithm used by the bank combining all of the above factors and includes other “secret” criteria that the bank requires. The banks scorecard is secret because thats what gives one bank an edge over another so they never disclose what the elements of the scorecard are – so next time you get a blank answer stating that you don’ t meet the bank’s minimum criteria, you know why. Second point is that some banks give 100% loans and others not. So I hope that clears up some confusing points regarding home loans in general, if you have anything further you are welcome to email us or call us any time. Prospective homeowners should explore their options prior to signing on the dotted line of a mortgage agreement. Probably the most critical thing to know and understand when acquiring a home loan is to know what the various terms mean. This can be accomplished easily by asking a lot of questions and asking your realtor to explain everything to you. Plus, some online browsing can turn up the answers to most of the questions that you might have. It is important to look at the different types of home loans that are available and to understand the differences among them. From a fixed rate to an adjustable rate to an interest only to a balloon mortgage, the choices are many and the differences among them are very large. If you do not understand what a particular type of loan means in terms of monthly payments as well as the duration of the payments, then you should not be signing on the dotted line. Potential buyers should also understand the various terms or words that are employed when dealing with real estate. Some of these include points, closing fees, recording fee, escrow account, and origination fee. If the loan that you are getting is a first time loan, then it is the primary loan and the primary lienholder. This means that the lender of this specific loan holds the first claim against the property for repayment of the loan holders debt. Home loans can be obtained at banks, savings and loans, credit unions, and financial lenders. Each lender assesses their own schedule of fees, offers their own range of interest rates, and their own selection of loan packages. In order to qualify for a home loan, potential borrowers will need to go through a pre-qualification screening. During this stage, each borrower is expected to bring a number of financial documents to verify their information. Once they pass that stage, they will continue with the application process. Additional paperwork is completed and processed. In order to receive approval for a home loan, the potential borrower needs to provide the following pieces of information: terms of employment, income level, level of debt, age of the applicants, and the type of home that is the intended object of purchase. Plus, the current interest rate and the size of the down payment can all influence whether or not the potential borrower is approved for the loan. The appraised value of the home will also come into play as well. When buying a home, it is important not to bite off more than you can chew. If a homeowner fails to pay on his home loan, the lender can repossess the home and the homeowner is left with nothing, except maybe bad credit. Full title describes the transfer of full ownership rights to the buyer. This means that you own the properties as well as the land it is build on. Examples of full title properties are vacant stands, houses, farms, plots, smallholdings etc. This word describes a normal house with an ERF number. Cluster houses are houses are a group of houses which usually has limited access and good security. Each house is individually owned and there is no levy to be paid, unlike sectional title. A property is classified as a smallholding if it is situated in or within a 150 km radius of a built up area, does not exceed 20 hectares and is able to be connected to a local authority water supply or has a borehole.There must be a home on the property and the main source of income must not be from farming on the property. If the smallholding is larger than 8,56 hectares, you will be charged an interest rate of 1.5% above the qualifying home loan rate. Residential property used for business purposes The property will be regarded as residential property provided that no structural changes are made which may affect its description as a domestic residential property. An interest rate of up to 1.5% above the qualifying home loan rate is applicable if more than half of the house is used for business purposes. Sectional Title living is governed by the Sectional Title Act 95 of 1986.When you buy a sectional title townhouse/flat you will have sole ownership of the townhouse/flat, together with joint ownership of the common property. You acquire a section which extends to the mid-point of the outer walls, the lower part of the ceiling and the upper part of the floor. This means that anything outside these borders either belongs to another owner or is common property. There is common property in sectional title living such as stairways and lifts, swimming pools, club houses, entrance foyer and outer walls etc. that are there for the use of all the residents. The common property is that part of the complex which does not form part of any section. Permission must be granted by the Body Corporate for any alterations to any part of the common property. The Body Corporate are responsible for the upkeep of the common property. However, the maintenance and repair of the hot water system is the responsibility of the owner who the system serves no matter where it is located. If the system serves more than one sections such as is the case with a boiler in some of the older complexes, the repair and maintenance is the responsibility of the Body Corporate. From the date of the first sale of a sectional title unit, a Body Corporate is instituted for the particular complex. The developer (until all units have been sold) and the other owners become members of the body corporate. As a registered owner you are automatically a member of the body corporate. This means you will be liable for the debt of the Body Corporate, so it is advisable that you study the financial statements of the Body Corporate before you buy such a property. Trustees are selected during the first meeting of the Body Corporate. Trustees may not derive any economic benefits from the Body Corporate, because they are trustees of the Body Corporate. Their responsibilities include the daily running of the complex such as sending out levy accounts, maintenance etc. These are normally monthly fees which each owner must pay to the Body Corporate to cover costs incurred. These levies will cover costs such as repairs & maintenance, rates and taxes, insurance premiums, garden services etc. In addition a special levy may be charged in instances where there is a shortfall in funds to improve certain structures. If you buy a full title stand in a security village, you will be subject to certain rules and regulations regarding common property. For example: the entrance gates, boundary walls, etc. For the maintenance of these common areas a Section 21 Company (Home Owners Association) is normally incorporated. Each owner automatically becomes a member of the Section 21 Company on the date of transfer and a monthly levy is normally payable by the owners to the Home Owners Association. If a sectional title complex is situated within a security village, it forms part of it – the development conditions of the Estate normally stipulate that all owners must become members of the Home Owners Association (HOA). The Body Corporate would therefore have to pay the levies that are determined for such an HOA and this amount will have to be included in the monthly levy that each sectional title owner has to pay to the Body Corporate. Townhouses are properties that are located within a complex. A townhouse of flat unit must be in an approved sectional title complex. The townhouse property can either be a semi consisting of one floor or a duplex which has two floors. The complex must only contain residential units. This describes two houses that are attached to one another. They may be on separate stands and bonded individually as ordinary houses. They can also be on one stand and bonded together under one bond. The other alternative is that they are sold as separate units in a sectional title development. Part one in a two part series on Bond types available. In SA it remains the most popular way of financing a property. The bond is paid off over the lifetime of the loan that can vary between 5 to 30 years. The monthly repayments include capital and interest repayments. Interest rates are an important factor to consider, since this will determine how much you pay for your home loan at the end of the day. Although there is a market rate, the interest rate varies from lender to lender. Increase your monthly payments to reduce the term and interest of your loan. Since the majority of each indivudual’s monthly installments will go towards interest repayments (especially in the beginning) you will greatly reduce your capital debt by such an increase. Interest is calculated on a daily basis and if your bond payment is due on the 30th of every month, make your bond payments five days earlier each month and save in the long term or split your payment amount between the 15th and the 30th and you save even more. If you make your bond payment on the 15th instead of at the 30th, you are saving 15 days worth of interest. For additional savings maintain your original payments even if the interest rate drops. This way you can pay off your bond in record time and save on interest, without any affect on your current budget. The access choice has more advantages than conventional bonds. With this bond a person has the opportunity to use the paid-off amounts at any stage and without prior permission from his financial institution. This kind of bond is convenient if a person needs money at a later stage for home improvements. They can pay for improvements when it is done and without having to pay interest on the full amount. Excess funds may also be used to purchase short term assets like furniture for example. However it is poor financial management, to use your bond facility to pay for short term debt. If you choose such an option you must be disciplined enough to keep the repayment short as well. You can also use this kind of bond to pay off your high interest debt like credit cards, bank overdrafts, retail accounts, personal & micro loans etc. The amount you save on interest could be invested into your bond for additional savings. Once again you must settle such debt as soon as possible if you want to derive any savings. 3. Covering Bond (Mortgage)A covering bond may be registered over immovable property to serve as security for a bank overdraft. Such a bond may be a first, second, third bond, etc. However it is not easy to obtain a covering bond from another financial institution once they have registered a first bond over a property. The reason for this is that the first financial institution will have first claim to the property in the event of liquidation. This kind of bond caters for all of your transactional banking needs. The single facility, secured by your home, fulfils all the functions of a cheque account, overdraft, personal and home loan. Basically it can be viewed as single credit facility or one large overdraft. It is designed to save you money because of lower rates, but you run the risk of losing your home if you cannot keep up with the payments. These accounts are expensive to set up due to the higher monthly admin fees and structuring fees. The interest only facility allows you to repay only interest on a loan for a predetermined period or over the entire loan term. The capital is repaid at the end of the term. This allows you to repay interest only on a loan, either for a specified period or the entire loan term, and repay the capital by a cash injection or bullet payment at the end of the facility. This product is common in the overseas markets, but in SA it is relatively new. Although this might seem like an attractive proposition for some, because of lower monthly repayments, there are a few factors to consider. You will remain in debt for much longer, and pay much more in interest over the term of your loan, because the capital amount never decreases. Your financial position will worsen if interest rates go up compared to an ordinary home loan. The reason for this is that the interest of a conventional home loan decreases over time, but with an interest only loan your interest repayments will increase with a increase in interest rates. This uniquely structured facility assists first-time home buyers to buy property without any upfront cash to pay for transfer and registration costs. It is appropriately also known as a 108% home loan. The interest on such a loan is higher than the norm, due to the higher risks associated with such a loans. However as soon as you have built up some equity you could then re-negotiate a better rate. It is important to enter the property market with a good understanding of how a property purchase works, how much you can afford to borrow, all the costs that are involved etc. · Know what you can afford. · What you can afford while interest rates are relatively low is not your most important criteria. · Most homes are re-possessed during times when interest rates are high and monthly installments become difficult to handle. Very few people can afford to pay more than 30% of their monthly income on bond repayments. Consider taking a loan for less than what you can afford at the moment. · Try to be disciplined to set up a savings plan for unforeseen expenses by not over committing yourself on bond repayments. What will happen if your car needs repairs or maybe you will need money for your child’s school fees etc. · Determine if you would still be able to afford a mortgage if interest rates go up with 5%. Major banks will grant you a bond of up to 25 times your monthly combined salary. Your monthly repayments may not exceed 30% of your joint monthly income (before any deductions). · In accordance with the National Credit Act banks must also determine each applicant’s affordability of the loan. This means that, after all monthly expenses have been paid, you would still need to afford this loan. · Use the Internet, estate agents, trade shows etc. · Is it a safe area (criminal activities etc.) ? · Is it in close proximity of schools, shopping centre, hospitals etc? · Does it have any recreational facilities (parks, golf courses)? · Drive through the area, go to the local shopping centre. Jot down positives and negatives. This will give you a good idea of the general condition of the area. · Many times a 5-10 percent cushion is built into the sales price of a home to allow negotiation of a sales offer. · Make use of a Comparative Market Analysis (CMA) report. This will disclose information on recent selling prices in a residential area, specific street etc. to assist you in getting a better idea of the market value of properties in an area. · The buyer submits a signed offer to purchase to the seller, which the seller can accept or reject. · On acceptance by the seller, your offer becomes a legally binding contract. · The contract set out certain terms of the contract such as date of occupation, occupational rent, purchase price, conditions of sale, etc. · During this stage you will experience pressure from some estate agents to have an “All In One” service, which includes the agent arranging your bond (mortgage) financing. · You, and you alone can decide if you want to arrange your own finance or through a bond broker (originator) of your choice, or not. · Getting a Loan From Your Estate Agent or the Mortgage Company in Your Real Estate Agent’s Office May Not Save You Any Money. · Most bond originators will pay your registration fees for example, whereas your agent might not be prepared to give up some of his commission. · It has been our experience that some Estate Agents are not educated enough and do not have the experience to originate mortgage loans. They spread themselves too thin and it ultimately hurts the buyer. Estate Agents sell property and Mortgage/Bond Companies originate mortgage loans/bonds. · Compare different banks to decide on your lender of choice. · Home loans can be obtained quickly and effortlessly with the right people on your side. · Contact a GPF Mortgage consultant to simultaneously apply at all the major banks and help you save money. · You can virtually obtain a home loan from the comfort of your home. · Your goal is to save as much as possible on interest, because saving on interest has the same net result as earning interest. · You can also go directly to a financial institution of your choice. For more information on financing your home why not contact one of our mortgage advisors to learn more about what you’ve read. Talking to an expert can make the difference between getting into the home of your choice or having to rent forever. You are currently browsing the archives for the Home Buying category.